I am so excited for today's First Look! It is none other than Cosmic Stars. Now you can create more personalized designs based on the recipient's astrology sign! Angie is such an amazing graphic and animation artist. She is the creative genius behind the cuties in Polar Pals, Nursery Deco, and No Peeking. Cosmic Stars is the first set in which we have critters and people! Cosmic Stars will be available for purchase on January 15th. Cosmic Stars comes in a 4x6 clear acetate sheet and will retail for $15.00. Cosmic Stars contains a total of 14 stamps -- all images. The stamp set is labeled with the astrology signs text, they are printed for reference only. Text stamps are not included. The girl with bow and arrow (Sagittarius) measures 1" in height. 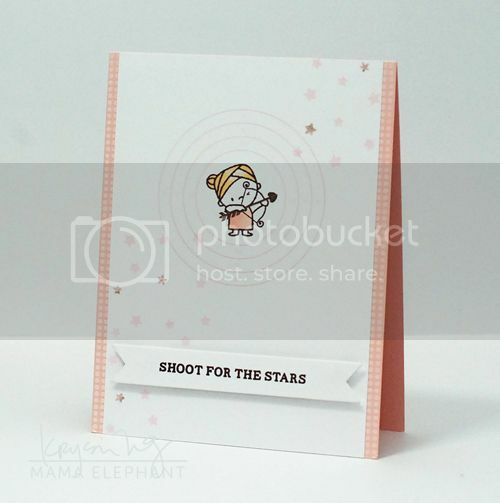 I am going to be a little stingy here and only show you the same Sagittarius girl we previewed, lol! But, twice! I picked up the same image from Cosmic Stars and the same sentiment from On Target to create two cards. 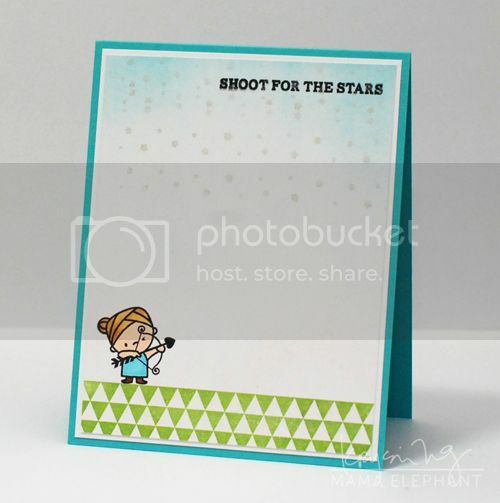 My first card uses the target stamp from On Target. I also used the dot border from Basic Borders to create the side panels. Little Miss Sagittarius was colored with Copic markers. I colored in some stars with my Sakura glitter pen. My second card uses the same stamps. I used a triangle border stamp from Trifecta to create the bottom base/grass (an idea borrowed from Wida Miller, see her card HERE). I swiped Distress ink in Tumbled Glass to create the sky. Then I inked up the star border pattern from Starry Night (also being released this month) in a silvery ink. The sentiment was stamped last. Be back tomorrow with the last First look of January and I've got a project I am particularly excited about! See ya! Can't wait to see the WHOLE set you tease....This is sooooo CUTE!! Love your cards... xoxo!! saaaweeeet!!!! ;) looking forward to see the rest! Kryssi you are so cruel with all your peeks!! This set in particular and its companion will definitely be coming home to me!! I really can't wait to see more of Smitten either!! Oh my goodness!!! The cuteness overload is off of the charts!!!! I am in LOVE!! January 15th can't get here soon enough!!! And both cards are sooooo amazing as soft and perfect! I can't stop looking at them! Hey! thanks for the shout out Mama Elephant!!! I like the snowy sky on that one too! Super cute! I can't to see all of this set. Your cards are sweet and pretty. i already LOVE this set! just adorable! Can't wait to see it in its fullness! This set looks to be absolutely adorable! Love both of these cards!! Love this set, I just have one question, I've been looking everywhere and find nothing about the 2 dots next to the star on top of the set, what are they for? Please help me!